If you have ever renovated a home, you know how important it is to choose perfect front doors Houston. The front door sets the tone for your entire home and has a huge impact on its curb appeal. Buying a front door should be an investment that lasts. It is important to take your time with this decision. You will want to be sure you wind up with a door that is beautiful and durable. Learning about popular styles is the best way to choose the best door for you. There are quite a few different materials and options available when it comes to front doors. Two popular choices are fiberglass entry doors and wood ones. Each of these styles has its own benefits and drawbacks. Knowing the advantages to each type can help you narrow down your options. For consumers who cannot find a pre-existing style they like, custom models are also available. 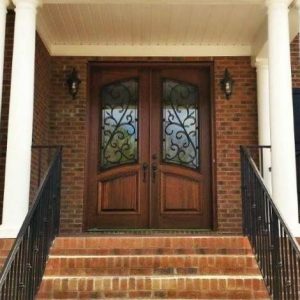 If you are searching for pre-made or custom front doors in Houston, visit Southern Front. They have a wide selection of doors available in many styles and materials. Consumers can see their current stock online by visiting http://www.southernfront.com. If you do not see a model you like, ask about custom solutions. You can contact Southern Front by calling 281-890-5860. They are able to ship to homes across the U.S. and Canada. Customers everywhere should start their search for doors at Southern Front. A growing number of homeowners are upgrading to fiberglass entry doors in Houston. There are many advantages to fiberglass over other types of doors. This material is very versatile. As a result, there are a ton of styles, colors and patterns from which to choose. People who want a unique look to their home should consider fiberglass first. Fiberglass doors are also much better insulators than wood or steel. They are stronger and more durable, and will last much longer. There are very few drawbacks to buying fiberglass doors. They do tend to be a bit more expensive than wood. Some people also find that they are not as rich looking as real wood. Others prefer the feel and aesthetic of patterned fiberglass. If you are thinking about upgrading your entry door, start your search at Southern Front. They have many fiberglass entry doors available in a variety of patterns and colors. You can take a look at their products online by visiting http://www.southernfront.com. Interested customers can also contact them by calling 281-890-5860. When most people think of a solid front door, they imagine one made with wood. Wooden doors have a lot of appeal, and in some cases, are preferable over fiberglass. Even well designed fiberglass does not look like real wood. If you want your door to have a heavy, rich texture, you should consider purchasing one made with real wood. There are types of wood that can compete with fiberglass when it comes to durability. Look for mahogany and knotty alder exterior doors. These types of wood are long lasting and insulate well. Avoid searching for cheap exterior wood doors in Houston. Cheap doors are not made with high quality materials. They will warp and deteriorate much faster than other types of wood. It might seem like a money-saving idea now, but it will cost you more later. Take the time to find a reputable vendor who can provide a quality door. Mahogany and knotty alder are not cheap, but they will be more cost effective over time. Customers thinking about upgrading to a thick wood door should visit Southern Front. They have a wide selection of doors made from a variety of types of wood. Consumers will be able to find doors made from knotty alder and mahogany among many others. You can see their entire product catalogue online by visiting http://www.southernfront.com. Southern Front can ship to locations across the U.S. and Canada. You can contact Southern Front to learn more by calling 281-890-5860. Some homeowners prefer to find custom front doors in Houston. In some cases, they are not able to find pre-existing models they like. In other cases, customizing a front door suits their home much better. Whatever the reason, custom doors are also very popular options. They are the perfect way to come home with the front door of your dreams. When you are looking for a retailer, be sure you take a look at past custom work. Some vendors will have this information online. You want to be sure that your custom door will turn out how you imagine. You should also look for a supplier that has affiliations with other respected businesses. These affiliations mean that the company holds itself to higher standards. They also mean that the company has a history of providing high quality work. If you are looking for a custom door, consider contacting Southern Front today. They are happy to work with customers to get them the door their home needs to look its best. You can view a catalogue of pre-made doors by visiting http://www.southernfront.com. They can ship their custom doors to homes across the country. Southern Front also has affiliations with many respected home builder’s associations. When you buy your custom door from Southern Front, you know it will be the best. Prospective customers can call Southern Front at 281-890-5860. Choosing a new front door is a big decision. You should buy a door in a style you love. There are advantages and disadvantages to each type of door you may come across. As you browse, remember that your tastes and the doors durability are most important. Avoid buying cheap exterior wood doors in Houston and instead focus on high quality ones. By keeping those tips in mind, you will come home with a door you love. Customers looking for the perfect new door should visit Southern Front. Southern Front has many exterior and interior doors available. Consumers are sure to find the perfect one for their home. You can visit them online to see their entire catalogue at http://www.southernfront.com. Custom models are also available. Contact them by calling 281-890-5860 to find the perfect front doors Houston.